Born and raised in South Africa, Botha made his mark in English rugby with Bedford Blues after being spotted rising through the Bedford Athletic ranks. The lock impressed in the 2009 Mobbs Memorial match between the East Midlands side and the Barbarians and signed for Saracens later that summer, where he quickly rose to prominence alongside former England skipper Steve Borthwick. Botha began his pursuit of Test honours with England by starting all three of the Saxons' matches of the final Churchill Cup in 2011 - after helping Sarries to a maiden Premiership title - and his performances earned him a call-up to Martin Johnson's 45-man training squad for the Rugby World Cup. While he missed the cut for the travelling party, Botha did win a first cap during England's warm-up games. 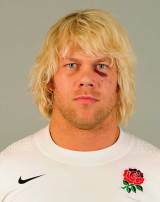 Just months later, and under the tutelage of interim England coach Stuart Lancaster, Botha took full advantage of injuries in the second-row department and started all five of England's games in the Six Nations. A homecoming followed as three further caps came on tour to South Africa that summer, although the ferocious Springboks didn't lay down the welcome mat to a prodigal son.